Substitute Ross Barkley scored a dramatic 95th-minute equaliser against Manchester United to maintain our unbeaten start to the season. 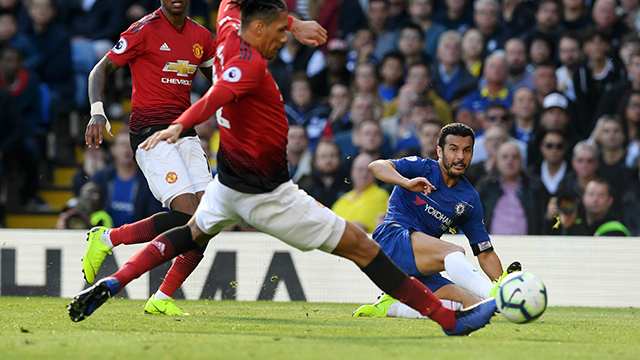 Since falling behind, United had offered little in the way of an attacking threat, and when they did get forward with one potentially dangerous counter attack Pogba’s pull-back was mopped up by the retreating Cesar Azpilicueta. David Luiz threatened soon after when he carried the ball from deep, exchanged passes with Hazard and stepped inside the challenge of Chris Smalling, the Brazilian's effort taking a deflection and rolling behind. Kepa had done well to parry away a stinging Mata drive, but as the United man kept it alive and hooked the ball across goal, we failed to clear our lines, leaving Anthony Martial with the simple task of finishing from point-blank range to make it 1-1. Strong, intelligent defending from David Luiz was enough to thwart Lukaku as United looked to hit us on the break, but United's leveller had undoubtedly created a more open feel to the game, particularly in comparison to the first half. Hazard found Azpilicueta who stood a cross up to the far post where David Luiz crashed a header against the inside of the post, and as the ball landed at the feet of Barkley the midfielder gratefully fired the ball into the back of the net to spark jubilant scenes and preserve our unbeaten start to the campaign.